Structural vulnerability due to tsunami loading can be characterized by a family of fragility curves, which are expressed as lognormal cumulative distributions of the conditional probabilities of reaching or exceeding various damage states for given values of the demand parameter, generally inundation depth. Such curves can easily be obtained from field surveys. However, what is required for risk analyses is total damage. This research presents a method of obtaining mean damage curves from fragility functions in the literature, using cost coefficients associated with each of four damage states. The curves are obtained for timber, masonry and reinforced concrete single-storey structures. They could also be fitted very well with negative power law expressions having two parameters, and quite well with negative exponential functions having just a single parameter (based on construction material) and the single independent variable of inundation depth. 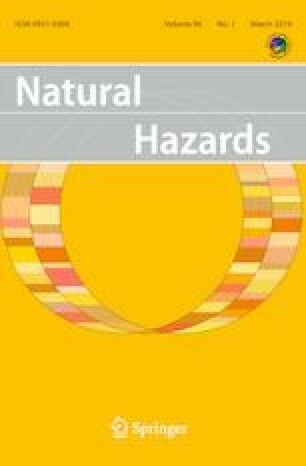 The damage curves can also be used to present the relative vulnerability of one construction material with respect to another; this could reduce the variability associated with different locations. The relative damage ratios for the different construction materials were found to be strongly dependent on inundation depth. Although there are large differences among construction materials at low depths, such differences disappear at depths of 6–10 m. Similarly, the effects of shielding and debris on damage were also found to be dependent on inundation depth. The results of this work can be used to introduce coupling effects into empirical relative vulnerability models that seek to incorporate many factors independently.